During Hurricane Sandy, ACUA’s Wastewater Treatment Plant came within 6 inches of flooding. If the storm had been worse, crucial infrastructure may have been compromised. Portable flood barriers can be inflated for use during storms and other high water events at the Wastewater Treatment Plant and at off-site pumping stations. Estimated cost: $100,000. An example of portable flood barriers. Sumps will be installed in the lower elevated buildings of the plant would be used to remove water from powerful storm surges and prevent flooding from causing failure at the facility. Estimated cost: $300,000. A seawall would be built to surround sections of the facility that are not at a high enough elevation to withstand flooding (indicated in yellow below). The seawall will protect the plant from storm surges that could cause a failure during storms and high water events. DC Water is currently installing similar technology along its Blue Plains plant to protect flooding from the Potomac River. Estimated cost: $8,500,000. The yellow outline shows the areas that would be guarded with a seawall. 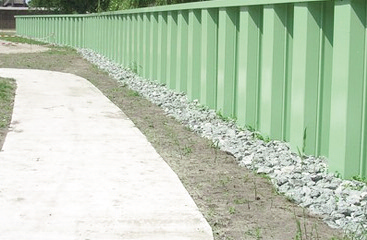 The second image shows an example of a completed seawall. Once we receive authorization for these projects, we are expected to put them out for bid in the spring and begin construction by summer. The seawall project is currently going through the permitting process with various regulatory agencies before construction can begin. We’ll keep you posted as the projects get underway.